LadderWORK's generated code is really efficent. Microprocessor's assembly code it's directly generated by the compiler so no other instructions charge will affect your result ( NO 'C' SOURCE GENERATED AND COMPILED PROCESS ). In this way with LadderWORK you always are sure to obtain the best size & speed optimized code. LadderWORK produce a Intel-Std HEX file as output. Also intermediate assembler and listing files are available as output of LadderWORK compile process so you can check instruction by instruction the generated code. Many PLC devices supported by LadderWORK software can directly upload the generated code simply pushing the UPLOAD button. A great number of build-in functional components are ready to be placed in your project. LadderWORK software includes a standard set of LADDER DIAGRAM (RELAY LOGIC) devices and a set of extra components, like pure-logical ports and user-programmable functions. Full ADVANCED version includes over 30 devices : input/output devices, relays, d-type flip flops, debouncers, clock generators, delay lines, up/down counters, comparators, fifo/lifo queues, A/D & D/A Converters, and/or/not logical ports and user programmable functions. Ladder standard language is strongly rigid. Components must be forced in predeterminated cells along two rails called rungs. Moreover Ladder standard language has great limitations about feedback connections. LadderWORK broken these limitations introducing the first free schematic ladder diagram. LadderWORK includes a powerful schematic editor. Components can be placed anywhere and there isn't limitation on feedback connections. LadderWORK schematic is more similar to an electrical circuit. Moreover LadderWORK includes extra components like logical ports and flip-flops so if you are well-versed in boolean logic you can approach your problem using these traditional notation. LadderWORK is remarkably intuitive ! With LadderWORK you haven't to know nothing about assembler, interrupts or hardware architectures. All you have to do is think your project as a electrical scheme where you have to disposition switches, relays and lamps. Switches means inputs, lamps means outputs and relays gives the way to create states and elementary memory cells. Many problems related to control automation can be resolved in few minutes using LadderWORK. Put a PLC into your microcontroller ! With LadderWORK you can transfrom a microcontroller in a PLC . Microcontroller support is activated simply selecting your MPU model during project setup. For example if i select the 8051 MPU the system put to disposition all the 8051 chip I/O resources. So when i configure my input or output devices i directly see the resource named P.0 .. P.7 which means that the system will drive the relative hardware pin . Full 8051 ADVANCED version includes USER FUNCTIONS so if you need a particular device you can write your assembly routine for your needing. LadderWORK run-time kernel is really small and the system requirements are minimum. For example, in a 8051 system the hardware requiments are just the TIMER 0, used for global timing, and less than 20 bytes of internal RAM including stack area. 8051 version of LadderWORK can be configured to use internal or external RAM with customizable memory mapping. The picture below, represents the apperance of the program LadderWORK on your computer. 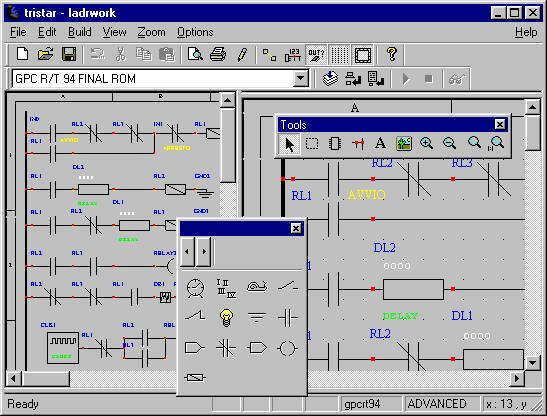 LadderWORK has an integrated enviroment feature, allowing you to draw schematics, compile programs and upload code to PLC always working on the same window. The integrated enviroments are composed by several parts described below. The 8051 microcontroller has an amount of RAM inside the chip. Normally this RAM array is 64 to 256 bytes. 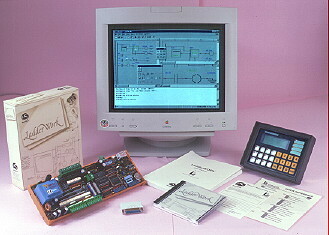 The 8051 can address an external RAM bank up to 64KBytes. LadderWORK can be configured to use the internal memory, the external memory or both. With LadderWORK you can easily create your custom mapping/compiler setting to fit the your embedded board requirements and save it in files called profiles. For the future a lot of new features will be implemented in LadderWORK software. Watching and probing capability : The variables related to the objects placed in the schematic could be watched. During PLC running a watch window will show real-time, the value of this variables. Also, the nodes in the schematic could be probed. Placing the probe component in a particular node will show the value of the node during running. Note that these feature will require a dedicated serial port. Remote Control : We are developing a subset of MODBUS(R) protocol. In the schematic you will be able to place MODBUS(R) modules to receive and transmit signals from/to the host system. IEC 1131-3 Compliant function blocks : Our goal is to meet the IEC / CEI 1131-3 standard. A lot of standard-compliant function blocks will be ready in the next issues of the software. DOWNLOAD A FUNCTIONAL DEMO OF LadderWORK NOW !